Newport Mansion 2nd from Beach - Watch the Dolphins Play! Enjoy cool ocean breezes and wake up to the sound of the waves. 4 floors of SEASHORE LIVING at its finest with ocean views from both inside and out! Watch the waves breaking on the beach, and if you are lucky, a few dolphins frolicking, while relaxing in the great room, dining, or simply preparing that fresh Seafood dinner! Spread out in the lavish Master Bedroom suite with panoramic ocean views and a glass railed sundeck for unobstructed visions! Wake up to sunrise over the ocean. Or, treat yourself to the private master 'spa' room with jacuzzi waterfall tub, and glass shower with raintree and spa jets! Relax on the 6 decks, covered porches, or screened porch. You are sure to find your 'special' spot for private time, or enjoy the rockers and conversation on the front porch with those family members you don't get to spend nearly enough time with. For the 'young at heart' there is the first floor Game room with pool/ping pong table and convenient kitchenette. In addition to the King bedded Master Bedroom Suite, there are 2 more Junior suites with Queen beds as well as a Family suite with Queen bed & futon bunk . Retreat to the oversized Home Theatre room with 50' LCD TV and DVD and wet bar with access to screened porch or deck on 2nd floor, or Master Bedroom with 40' plasma TV & Roman type spa, or just gather in the Great room with the wet bar and wine refrigerator. Maybe you'd prefer a snack in the top of the line gourmet kitchen with granite counter tops, Sub Zero refrigerator, Bosche dishwasher, Thermadore double wall ovens,and warming drawer. Whether you enjoy the convenience of the outdoor shower, or the proximity of the beach path located just a house away from you and the much coveted Poverty Beach location----- ITS ALL HERE FOR YOU TO ENJOY!!! Our home is conveniently located just a 2 minute walk to the much coveted Poverty Beach, and yet just a short 5 minute bike ride to the nearest restaurant. Located in a quiet residential neighborhood, we enjoy the convenience of town center and Washington Street Mall a 5 minute car ride away, yet relax in the tranquility that exists while watching the waves meet the beach, or often, the dolphins playing just offshore. 50' Sony HDTV in Home Theater, 40'LCD in Master, and Sony flat screen in Living area with Comcast digital. 4 stop Elevator, Home Theater Room,3 Wet bars, 2nd Kitchenette, and 2nd Laundry area. Just returned from this vacation home.We had our family and extended family from Virginia join us here. The home is immaculate. We found every room beautiful, and we found the space to be perfect for the 12 of us with baby. The only draw back is that there is no view of the ocean, except from the master bedroom. So although the decks are beautiful you overlook large shrubs and do not hear the ocean.However with the short walk to the beach and a home that allows for great family gatherings you will not be disappointed . Without question one of the finest vacations ever! 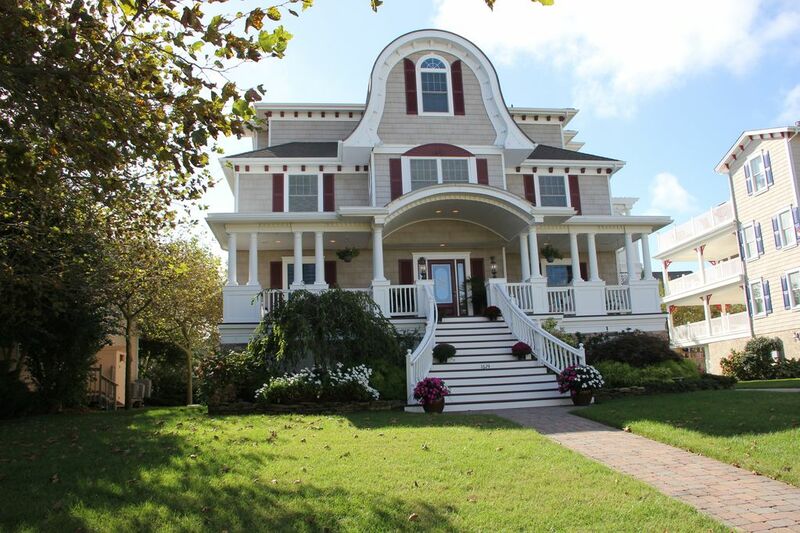 I recommend Cape May and this beautiful house to everyone. The house is elegant, immaculate, beautifully laid out and perfect for our large family. With the beach literally 1 block away we were able to fully utilize the house and beach (even with toddlers). Our family of 14 just returned from Cape May and these wonder accommedations. We have stayed in many place over the years but this was by far the best home and area we have vacationed in. It easily slept the 14 of us and with all the room in the house no one was ever in anybody"s way 6 bedrooms and 6 /1/2 baths , can't beat that. The furniture was exquisite and the floor plan gave us plenty of space. The location to the beach was walking distance and the town of Cape May is absolutely charming. I would highly recommend this home in Cape May with plenty of kudos. Prime Poverty Beach location. Beach entrance less than 300 feet from our home. Property manager available to meet tenants upon arrival with keys, beach passes, beach gear, and local information and points of interest. If interested in this home and you would like to speak to the owner, please feel free to contact us at leslie@leslierice.com.